Next up I’ll be reading at Arkansas State University – Mountain Home on Tuesday. I’ve never been to this campus before, but it doesn’t take much time searching online to find that this school is a vibrant place. Concerts, lectures, they have it going on. Here’s a shot they shared with me of the announcement that’s running on the screens on campus. At this event, I’ll be reading from Underwater Panther in the Gaston Lobby of Roller Hall, which I’ve been told is an impressive building. It means a lot to me that my first two readings for this book are at community colleges. Community college has made all the difference in my life. This started with my father. His first class there, composition — a challenge for a first-generation American who graduated from a high school that emphasized technology — set him on a path that led him to become an educator. Because of the foundation he got there, he was able to be a powerful positive force not only my life, but in the lives of hundreds of thousands of students. Community colleges do vital work with minimal resources. My father always said that he learned more from his students than they learned from him, and I never understood what he meant until I began teaching at community college. With the shooting at the community college in Oregon last week, I find my thoughts focused on my community college students and colleagues. 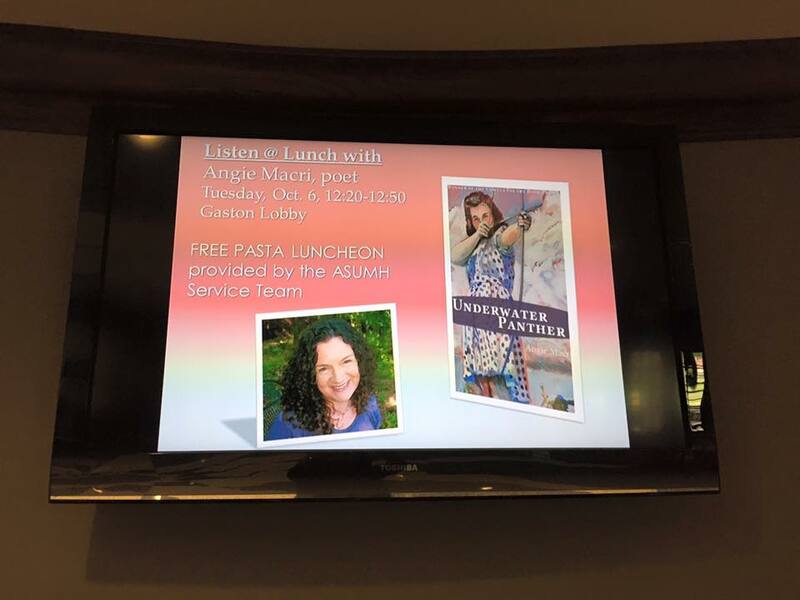 This entry was posted in readings and tagged ASU-Mountain Home, community college, poetry, Underwater Panther on October 5, 2015 by Angie Macri.